Carbon dioxide (CO2) emissions associated with coal consumption in the United States fell by a record 231 million metric tons in 2015. 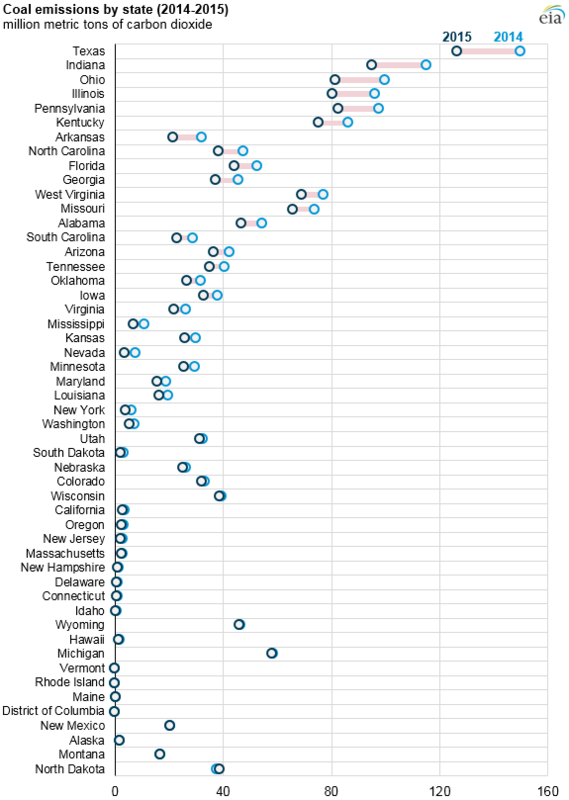 More than 60% of the annual decrease occurred in 10 states, led by Texas, Indiana, Ohio, Illinois, and Pennsylvania, according to EIA’s state-level carbon dioxide emissions data. 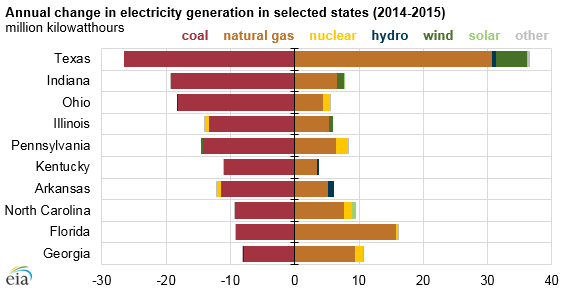 Most of the decline in 2015 U.S. coal consumption occurred in the electric power sector, where reduced coal-fired electricity generation was largely offset by higher natural gas-fired electricity generation. 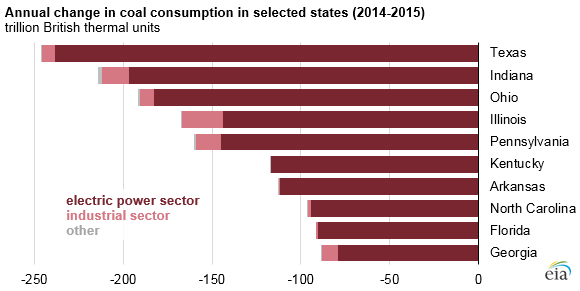 In 2015, a decline in coal emissions occurred in nearly every state. 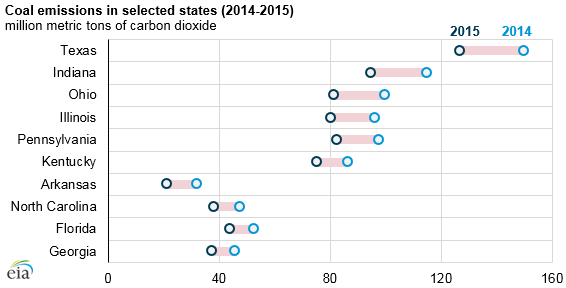 CO2 emissions from coal only increased in four states during 2015; another three states and the District of Columbia produced zero or nearly zero coal emissions (less than 50,000 metric tons) in both 2014 and 2015. Total energy-related CO2 emissions fell in 2016 and are projected to fall in 2017 and rise in 2018, based on EIA’s latest Short-Term Energy Outlook projection. Although natural gas generation increased, the CO2 emissions associated with that natural gas consumption were not enough to offset the decrease in coal-related CO2 emissions in 2015. Coal-related CO2 emissions across all sectors decreased 231 million metric tons from 2014 levels, and natural gas-related CO2 emissions across all sectors increased 43 million metric tons. Energy-related CO2 emissions from natural gas surpassed those from coal for the first time in 2015, totaling 1,482 million metric tons compared with coal’s 1,467 million metric tons. However, because natural gas is less carbon intensive than coal, about 80% more energy was provided by the natural gas (28.2 quadrillion British thermal units) consumed in 2015, compared with coal (15.5 quadrillion British thermal units).